Lots of pretties have shown up or been purchased the last couple of weeks. Let's begin, as usual, at the top. A quick trip to the comic shop got me a copy of Elric: The Balance Lost by Chris Roberson. I had read the first issue last year and liked it, but waited for the trade. See the firs volume shows Roberson has some very grand plans to bring together many of Moorcock's Multiverse characters, and I'll be damned if I'm going to miss it. The next 2 were also purchases. Ex-Patriots by Peter Clines is the sequel to the superhero/zombie mash-up Ex-Heroes that blew my expectations away. The Ghostwriter by Zoran Zivkovic is his latest novella release from PS Publisher. I've been amassing quite a Zivkovic collection over the past year. Now on to review copies of which I've already devoured the first. Coming in June is Scalzi's Redshirts which skewers early Star Trek quite well and then it goes off into some truly meta lands. Wake of the Bloody Angel is Alex Bledsoe's latest Eddie LaCross novel, which I've been a devotee since the awesome The Sword-Edged Blonde [reviewed here]. The new couple are from Night Shade who is still batting strong numbers. First is Laird Barron's debut novel The Croning another I gobbled up soon after receiving. I' making an early call marking this as the Horror debut of the year. Next is Ellen Datlow's annual The Year's Best Horror 4 that I'll probably dip into between other things. Then we have Mary Gentle's The Black Opera mixing secret societies in Italy and the opera in a bid to empower the Devil. 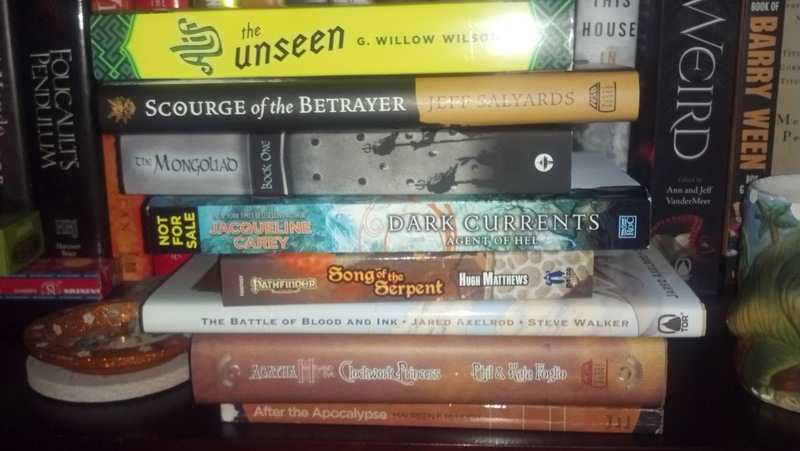 Last in this stack is the gargantuan The Weird edited by Ann & Jeff VanderMeer. I hope to tackle this in some fashion over the next 2 months. Maybe as a few separate posts examine groups of stories. Alif the Unseen by debut author G. Willow Wilson intrigues me great as it marries hacking and the secrets book of the djinn. Another debut I've been looking forward to is Jeff Salyard's dark military fantasy Scourge of the Betrayer. A lot of comparisons to the Black Company novels are abounding. Next is the group novel The Mongoliad, which I'll be dipping into quite soon. Then we have Jacqueline Carey's Dark Currents, which starts a new Urban Fantasy series. I've never read a Carey book, but have heard good things about a lot of her work. Song of the Serpent by Hugh Matthews is the latest Pathfinder novel. This one is going right to a friend who runs a Pathfinder game. I'm hoping he'll do a short review for us. The Battle of Blood and Ink is a Steampunk graphic novel that I'll definitely reading soon. It should hit stores soon as well. 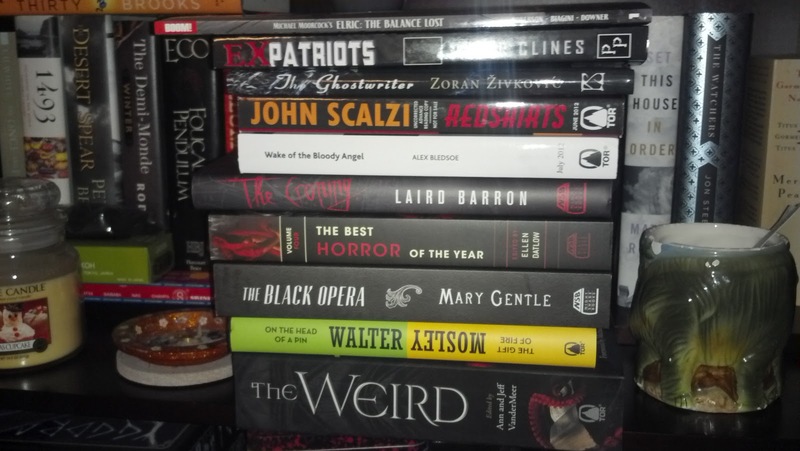 Next are a couple buys from my new local bookstore, which had a surprisingly good selection for its size. Agatha H and the Clockwork Princess by the Foglios keeps me current with the graphic novel series turned prose series and Maureen McHugh's short story collection After the Apocalypse is one I've been meaning to get for months.